Megyn Kelly’s NBC show, “Megyn Kelly Today,” is in jeopardy after she made comments defending blackface this week. But the show had already been a ratings nightmare for NBC, which signed Kelly for a reported three-year, $US69 million contract last year. “Megyn Kelly Today” averaged 2.4 million viewers a day in its first year, lower than the competition, ABC’s “Live with Kelly and Ryan,” and her former show at Fox News. On top of the low ratings, Kelly has been unhappy with top executives at NBC and alienated colleagues, according to The New York Times. CNN Business reported that NBC is prepared to cancel the show. 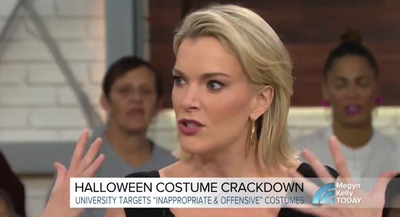 Megyn Kelly’s NBC show, “Megyn Kelly Today,” is in jeopardy after the former Fox News host made racially insensitive remarks on Tuesday’s show, in which she defended blackface during Halloween. Since then, Kelly has split from her talent agency, CAA, and did not appear on “Megyn Kelly Today” on Thursday. She is likely to not appear Friday either, with repeat editions airing instead. According to CNN Business, which cited anonymous sources, NBC is prepared to cancel the show, but negotiations are still underway. But “Megyn Kelly Today” was a risky bet even before Kelly’s comments this week, and one that hadn’t been paying off for NBC, which signed her for a three-year, $US69 million contract last year, according to The Wall Street Journal. In its first year, Kelly’s show averaged 2.4 million viewers a day, a drop of 400,000 viewers from that hour’s average before she began hosting, according to Nielsen (via The New York Times). For comparison, ABC’s “Live with Kelly and Ryan,” which also airs at 9 a.m., led “Megyn Kelly Today” in ratings by an average of 747,000 viewers a day, according to The Wall Street Journal, and saw a spike when Kelly began hosting at NBC in that time slot. And “The Kelly File” averaged 2.7 million viewers a day in her last year at Fox News. On top of the disappointing ratings and the blackface comments, Kelly has been unhappy with top executives at NBC, according to The New York Times, and discussed with NBC News chairperson Andrew Lack a “winding down” of her show earlier this month. She has also “alienated” colleagues, the Times reported, with her coverage of certain sensitive topics, including how she reported on sexual misconduct allegations against NBC personalities Matt Lauer and Tom Brokaw.